I recently posted a picture of this hairstyle on instagram and so many of you asked for a tutorial! If you don’t get it right the first time, don’t give up! This one takes a bit of practice! It even took me a few different tries to get it just right. Step 1 / Begin by dividing out a section of hair at the top of the head. Create two parallel part lines at the corners of the forehead and clip down the bottom hair. Step 2 / Now pick up a section of hair near the hairline and divide it into three smaller pieces for the french braid. Step 3 / Braid this top section of hair into a french braid by crossing the side strands over the middle strand while incorporating new sections into the braid. Step 4 / Once the braid reaches the crown, stop adding in new hair and braid the section to the end in a regular three strand braid. Step 5 / Slide two bobby pins over the bottom of the braid so it doesn’t unravel. Step 6 / Take the rest of the hair, tie it up into a high ponytail, and unravel the end of the braid. Step 7 / Now divide out a small section of hair from the ponytail and then take a mesh donut and pull the rest of the ponytail through the center. Step 8 / Take a small section of hair from the ponytail and with the bottom section left out, begin a fishtail braid. Step 9 / Take a small section from the top section and crossing it over and into the bottom section. Step 10 / Then take a small piece from the bottom section, cross it up to the top section and add it in. Step 11 / Now take a small piece from the top, cross it over to the bottom, then pick up a new section of hair from the ponytail and cross it over and into the bottom section. Step 12 / Then cross a small section from the bottom over and into the top section. Step 13 / Now just repeat those steps creating a fishtail braid around the mesh donut until all of the hair from the ponytail is incorporated into the braid. Step 14 / Once all of the hair from the ponytail is brought into the braid simply braid the rest of the section to the ends in a regular fishtail braid. Step 15 / Now wrap the braid around the bun, tucking it underneath, and then secure it in place with bobby pins. 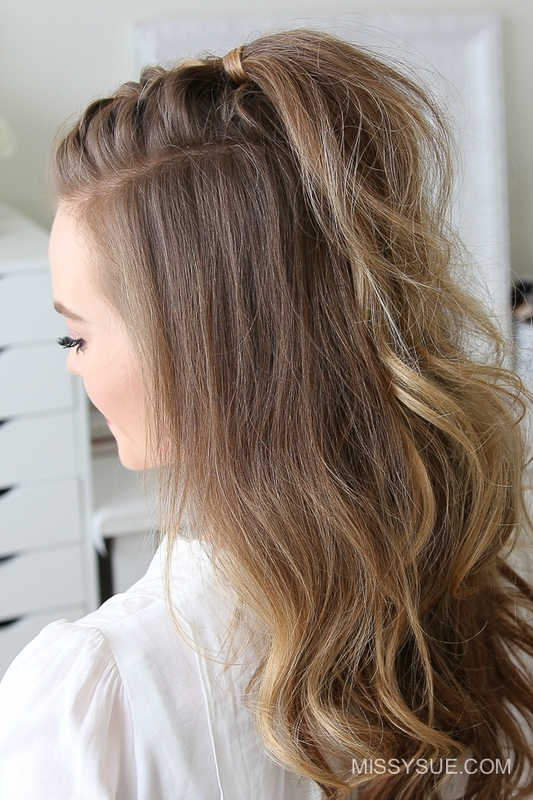 A few tips to keep in mind when creating this bun is to bring in sections that are a medium-thickness. If they’re too small then you’ll see the mesh donut through the sections and if they’re too large then you won’t have enough hair to braid all the way around the bun. Another tip is to keep the braid fairly tight when working around the bun because this will help the bun maintain it’s share and it’s always easier to loosen the braid rather than try and tighten it up after it’s finished. The holidays are here so I wanted to quickly share one more holiday inspired hairstyle. This dutch braided bun is a lot easier to do than it looks and would be such a fun hairstyle to wear for a new years party! Dress it up or down and wear it as an everyday style. 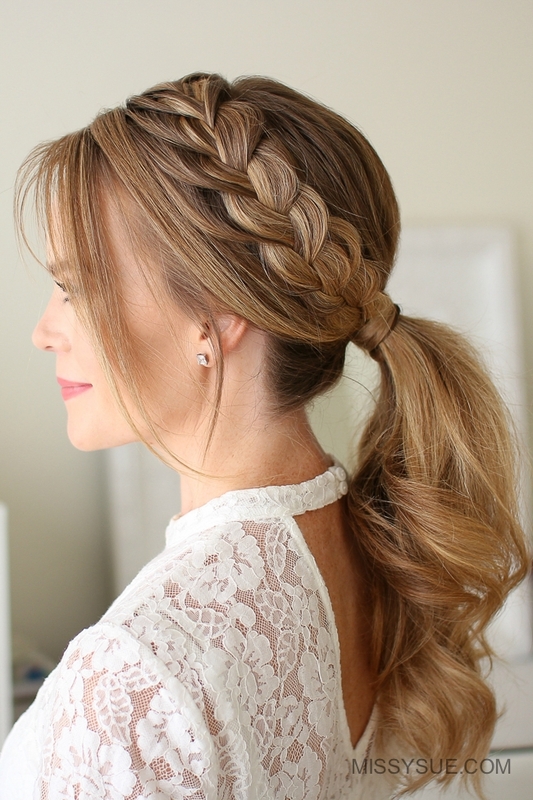 It’s a great heatless hairstyle too and could be done with one braid instead of two. Let me know what you think and I hope you enjoy the tutorial! Step 2 / Pick up a small section of hair on the right side of the part and divide it into three small pieces for the dutch braid. Step 3 / Cross the right strand under the middle and then cross the left strand under the middle. Step 4 / Then cross the right strand under the middle, pick up a new section of hair and cross it under the middle strand as well. Step 5 / Then cross the left strand under the middle and pick up a new section of hair crossing it under the middle strand. Step 6 / Then just repeat those steps continuing the dutch braid, angling it towards the back of the head until hair is brought in from underneath the right ear. Step 7 / Then braid the section a little further down and slide two bobby pins over the bottom. Step 8 / Now repeat those steps and create a second dutch braid on the left side of the head crossing the side strands under the middle strand and angling the braid towards the back of the head. Step 9 / Once the braid reaches the other braid remove the bobby pins from the first braid and combine it with the second braid. Step 10 / Then continue crossing the side strands under the middle while bringing new sections in the braid until all of the hair is combined into one braid. Step 11 / Now braid the section to the ends and wrap it into a spiral towards the left side at the nape of the neck, tucking the ends into the center. Step 12 / Then slide bobby pins around the outside of the bun and in the middle as well until it feels nice and tight against the head. Step 13 / Then go back over the braids and gently pull on the edges to make them a little fuller. Step 14 / Set the style with a medium-hold or firm-hold hairspray. I have been on such a ponytail kick lately and just can’t get enough of them. I wore this lace braid ponytail recently and posted a picture on the gram. Many of you had asked for a tutorial so I thought it’d be fun to share it as today’s tutorial. Adding a simple, lace braid is such a great way to take your basic pony to the next level so I really hope you enjoy it! Start 1 / Start by parting the hair on the right side. Step 2 / Divide out a section of hair to frame the face along with a small section of hair to add into the ponytail at the end. Step 3 / Then divide out a 3″ section of hair for the braid and brush the rest of the hair back to keep it out of the way. Step 4 / Pick up a section near the part for the braid and divide it into three smaller pieces. Step 5 / Cross the right strand over the middle and then the left strand over the middle. Step 6 / Now cross the right strand over the middle and pick up a new section crossing it over and into the middle. Step 7 / Then cross the left strand over the middle, picking up a new section and crossing it into the middle as well. Step 8 / Now I’m going to cross the right strand over the middle but stop adding in new sections on this side of the braid. Step 9 / So then cross the left strand over the middle, pick up a new section and cross it over and into the middle strand. Step 10 / Repeat those steps crossing the side strands over the middle strand while only bringing in new pieces to the left side of the braid; working down the left side of the head. Step 11 / When the braid reaches almost to the top of the ear, stop adding in new sections and just braid the rest of the section to the bottom in a three strand braid. Step 12 / Then cross two bobby pins over the end so it doesn’t unravel. Step 13 / Now go back over the braid and pull on the edges to make it wider and more full. Step 14 / Take the rest of the hair and combine it into a low ponytail near the nape of the neck. Step 15 / Add the braid into the ponytail along with a small section of hair in front of the braid. Step 16 / Now tie it all together with a hair band and remove the bobby pins from the end of the braid. Step 17 / Take a small section of hair from the ponytail, wrap it around the hair band and pin it underneath with a bobby pin.